In Cecelia Ahern's latest release, and one of my favourite novels of hers, we follow Sabrina as she discovers a part of her father's life that she had no idea about; a part of himself he kept from many in his life for quite some years. Told from the perspective of both Sabrina, and her father Fergus, we watch as they both piece together parts of his life that are unknown to them - unknown to Sabrina as they have been cleverly concealed by her father, and unknown to Fergus himself as he has suffered memory loss due to a recent stroke. The story that unfolds is intricately woven with a deep history, starting with a large collection of marbles and ending with just a single marble. With her father in a full time care home, Sabrina receives a number of boxes of her father's belongings that will take her on quite the mystery and journey of discovery, taking place in just the one day, when she finds a rather large, and valuable, collection of marbles in her father's belongings. From all the memories she can recall, there is no recollection of her father owning a marble collection, much less a collection worth thousands of dollars. Having fallen in to the abyss of the marble inventory, she discovers a number of items missing, valuable items missing, and sets out to find where those marbles have got to. The simple task soon turns in to a much more complex adventure, with Sabrina learning things about her father, and herself, that would never have come to light had it not been for some missing marbles. I love Cecelia Ahern's stories, I've made no secret of that, but this particular plot and meaning behind the story really sticks with me as a favourite. It's the kind of book that makes you think and leaves you with lingering thoughts. It forces you to take a deeper look at yourself and those around you. We all have secrets, or things we chose not to communicate - whether we're protecting someone, or embarrassed to share something, or haven't found the right time, whatever the reason - The Marble Collector shows the problem with that, exploring the consequences of bottling something up and just how much it can affect us personally as well as those around us. Another thing to note with this Cecelia Ahern novel is the beauty and rawness in such a simple and yet layered plot. The Marble Collector is rife with these sweet and tender moments that draw you in to your own memories of family, conjuring your very own nostalgia and sentiment. More than once whilst reading I found myself lost in thought and putting the book down, not because I wasn't interested in where this was all going, but because I wanted to hold and treasure that memory that had come to mind. Something I really enjoyed, but hadn't entirely expected, was the heavy involvement of marbles in this book. I know, the title is kind of a give away, but often times with books these days the title has very little to do with the actual book, or just something that happens in passing - perhaps the discovery of marbles at the start of the book being as mentionable as it gets - but that wasn't the case with this. Marbles are an intrinsic part of The Marble Collector, each chapter, memory, story, they are there and ever present. The way in which marbles feature is cleverly done and wonderfully so. Character wise, we truly only get to grips with Sabrina and Fergus, but I'm okay with that. We didn't need to know anyone else on a deeper level than we did, and had we got to know them a little more it would have only taken away from the two narrators. There were many other characters present, all of which had their place and personality, but they were not on the same level as father and daughter. The depth with which we got to know Fergus was pretty amazing, going all the way back to his childhood, with many scenes from his youth, learning just how important those days were to him and how much they shaped his future. One thing I always admire in Cecelia Ahern's novels is her imperfect characters, they have flaws, as we all do, and that in itself makes them perfect. I'm sure you've heard me gush enough, so I'll wrap up this post by saying I highly recommend picking up The Marble Collector - it would make a great book club read too! I love stories with family secrets! One of these days I will try this author, I know she has a lot of great books. She sure does - some of her earlier work is my most favourite, but I'd also highly recommend starting with this one too as it has been an instant favourite of mine. I've enjoyed lots of CA's books and I think this one sounds great too. I love that it involves family secrets and it is deeply layered. Those are two things I love. And I'm curious now to see just what role the marbles play in the book. It was already on the TBR but now I've shoved it up higher! 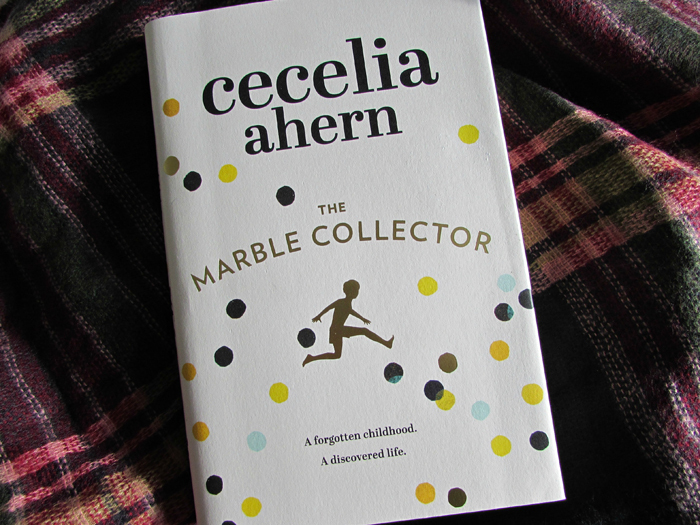 Ah, I don't think you'll be disappointed with The Marble Collector - it's just beautiful! I look forward to seeing your thoughts in the future.